I had the pleasure of handing over a surfboard to Neil Cooney last night. The WCSC decided to commission the board for Neil in thanks for his tireless efforts to make the council see sense over their development plans in Doolin which pose a threat to wave quality and access at Crab Island and Doolin Point. Despite the inauspicious surroundings of a dark and rain slicked side street beside Kenny’s in Lahinch, it was a good moment. Neil and his crew were a few pints down but appreciative none the less. 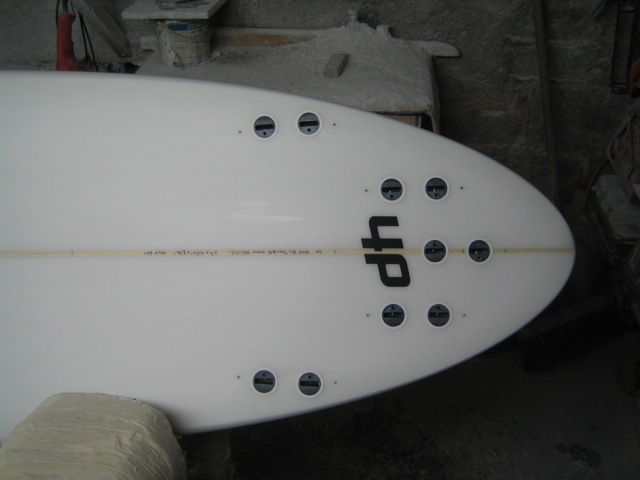 6’6 x 18 3/4″ x 2 3/4″. Neil is about to head off to Oz and won’t be surfing this board for a while. In that respect the dimensions of the board are a bit of a stab in the dark at what might suit him after a year of honing his skills on the other side of the world. Whatever way you look at it, it is apt that he got a board that will let him hook into a few at Crab (assuming it is still breaking…) and this one should do just that. It is rigged as a quad, with the centre plugs in so Neil can mix it up.